It’s not difficult to persuade encourage suggest that people have a drink. Everyday work stress leads to the vast majority of the population wanting to let their hair down in their spare time, and this particular gadget makes drinking even more of a game than it already is. Stick the various parts to the fridge and create your own cocktails in a super stylish fashion. Pour a mixer into one funnel and alcohol into the other and watch them mix and swirl as they filter through the machine. It’s a mixture of kerplunk and Mousetrap, with the winner getting the most intoxicated! 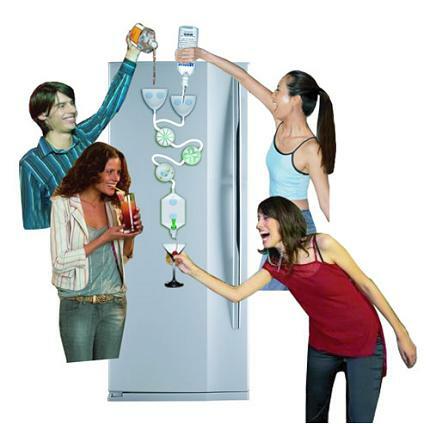 You can connect up an Ice Chamber, vortex funnel and variety of pods to your fridge and then have some serious fun!